Lovely apartment rated 4*, 45m2(484sq ft) in a private mansion dating from the 17th century, tastefully renovated and decorated. 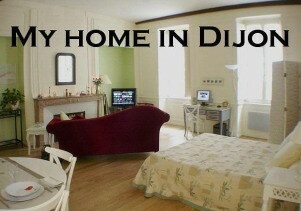 The home in Dijon will meet your requirement of charm and comfort. Located in a quiet street in the historic heart of Dijon, near the Fine Arts Museum and the Ducal Palace and overlooking Magnin museum. The apartment consists of: a large sitting room of 35m2 (377sq ft), with parquet flooring and a bedroom area (queen size bed, with down-free bedding), flat screen TV (CNN, BBC World, Skynews…), DVD player with DVDs , high speed internet with a desktop, FREE telephone calls to 103 countries, a library. A fully equipped kitchen, breakfast provisions are provided for the guest to cook as well as first necessity food in the fridge on arrival, a bathroom with bath and separate toilet with basin. Washer dryer. Non smoking apartment for 2. Air conditioning. If you come by train, I’ll be glad to collect you at the railway station.